Developers are racing to bring new housing units out of the ground in an effort to take advantage of favorable construction loans and to relieve pressure on the heated housing market. Additions to supply failed to maintain pace with economic improvement following the recession, leaving a shortage of homes available for newly employed workers. High rents for luxury apartments and elevated home prices, meanwhile, are encouraging developers to focus their efforts at the top of the market. As a result, supply and demand for entry-level housing remains significantly imbalanced, keeping conditions at single-family rentals and Class B and C apartments relatively tight. 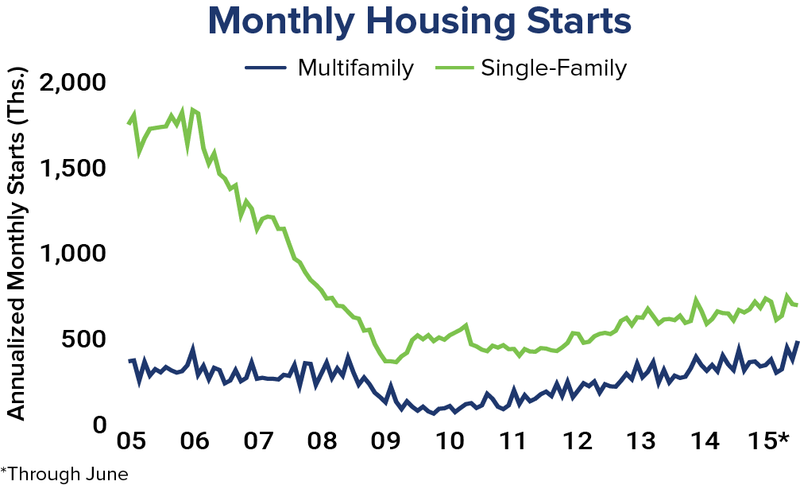 In June, the number of housing starts increased to an annualized 1.17 million units, up 10 percent from May and 27 percent from the same month last year. 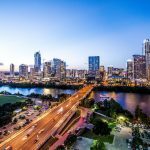 The entire increase can be attributed to multifamily starts, which hit a multi-decade high of 476,000 units last month and soared 29 percent from May. The focus on multifamily housing, particularly in the Class A segment, will test the size of that high-end rental pool. Single-family starts retreated 1 percent to 685,000 homes. Although overall supply is slowly realigning with demand, a disparity exists between the mix of construction and housing demand. The median existing home price in May was on par with the peak during the middle of the last decade. 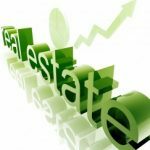 New home prices, however, are approximately 15 percent above the pre-recession peak and nearly 25 percent above existing home prices. New-home prices have tapered off recently, which could be a sign that builders are refocusing on lower-income buyers. For the first time since the beginning of the recession, the birthrate in the U.S. increased in 2014, according to the Centers for Disease Control and Prevention. As young couples regain their financial footing, the birthrate should continue to climb, generating demand for households with additional space. Educated women in their 30s are at the forefront of the increase. At the same time, apartment developers are favoring smaller units. The share of studios and one-bedroom apartments increased to more than 50 percent of new units constructed between 2009 and 2014, which will funnel demand for new families into larger, single-family rentals.